The above is a famous quote from the famous movie, Pirates of the Caribbean series. And this quote says it all. It is not the problem or the circumstances that we face in life that determine our outcome, but our attitude and how we treated our problems and the situation that truly count. Therefore, if you want to produce greater success in life, the first thing you need to do is to evaluate your attitudes and behaviors. Are they helping you get what you want in life? Or are they stopping and limiting you from going further? A lot of people fail to realize that the problem is in them and not on the problem itself or the situation. They fail to see this because they are “in the situation”. Just like fish will never know that they are living the water. It is difficult for someone to discover that they are the cause to the effect because they are parts of the equation. This is why people choose to blame, criticize and complain rather than taking responsibility for what has happened. They fail to see that they are the cause to their problems in life. When people fail, they thought that it must be due to something or someone else, which are definitely not themselves. If this is happening to you, it is alright because it happens to everyone. The key is to do something with it and change. Hence, what you need to do to produce greater success in life is to change your attitudes and behaviors. You need to adopt empowering attitudes and develop positive behaviors that will get you what you desire in your life. Below are the 10 attitudes and behaviors that can greatly boost your chances of success in life and at work. So consider making them part of your life. One of the very first attitudes of success you must adopt is to build a strong desire to achieve more. If you look at success, it all started with a burning desire. Your desire for greater achievement is what pushes you and produces an inner drive to achieve what you want. A goal without a desire is just a wish. And your desire for your goal is not strong enough, you tend to treat it as a wish, which means, it is alright regardless of whether you achieve it or not. This is exactly what is happening to most people out there. They fail to achieve their goals because they don’t have a strong desire for them. When they feel tired, they choose to rest and sleep rather than continue to push forward and work on their goals. When their friends ask them for an outing but they know they shouldn’t because they need to work on their goals, they’d still choose to go with friends anyway. Desire empowers you to meet the challenges of life and go way beyond your limit. It compels you to fulfill a purpose larger than your circumstances. You are willing to reject your friends, choose to not watch TV, wake up early and stay later even when you’re tired, and go against all the odds when your desire for what you want is strong. So, develop this as your attitude. It will make you committed to what you want in life. I know you have heard this a gazillion times. People keep telling you that you should follow your passion over and over again if you want to be successful. This may be a very common behavior you need to adopt, but it is one that you should not ignore. I’m proud to say that Air Asia is a product of Malaysia and I’m from Malaysia too. The CEO of Air Asia, Tony Fernandes says that employee satisfaction is the most important measure of a company’s success. Workers who are enthusiastic commit and are willing to go the extra mile compared to those who just work for their paycheck. Imagine that a company where the staff is bored with their job, they don’t really care about their company’s vision or mission, and all they do is to work and get their paycheck. Do you think this company can go far or do you think the next company will perform better? Another company, on the other hand, the staff is super enthusiastic about their work and their company’s vision. They are positive about their future and opportunities are unlimited. The entire team is working wholeheartedly and always finds out creative ways to do things in a better and smarter manner. You can feel their passion and joy at work. Now tell me, which company do you think will succeed and perform much better? The answer is really obvious. This explains why passion and enthusiasm are extremely important in life and at work. Even if you are not running your own business, you need to be enthusiastic about your work, no matter what position or industry you are in. When you are passionate and enthusiastic, you are willing to give your best and take the challenge, you feel good about your company and your work, and more importantly, you are willing to put in more effort to improve and do better. Another key to success is to adopt the attitude of constant improvement. I believe that you have seen people who worked hard their entire lives but they have nothing much to show by the end of the day. This happens because they do not commit to mastery. They are simply repeating what they do day in and day out. In order to produce amazing results and position yourself as an expert in your industry, you need to master the skills and become the best in what you do. Think about it, if you love jogging and you have been jogging for the past two decades, does that make you a professional athlete and are able to compete at the Olympics level? The answer is no. Have you seen people who have work in the same job or industry for years, but they are going nowhere? This is because they think that all they need to do is to work hard, but little did they know that working hard alone is not going to get them anywhere unless they commit to mastery. Highly successful people are always looking for ways to improve, to do things better, and to receive more results by putting in less or similar effort. You may say that they are lazy, but this is the only way to achieve more, provided that we all only have the same 24 hours a day. Take a professional athlete like Usain Bolt as an example. He trains and runs every single day. Not only that, he has coaches to guide him throughout his entire career. When he runs, he and his coaches measure not just the time he finishes the run, but also many other metrics such as his heartbeat rate, blood pressure, his breathing, his focus, and much, much more. This is what separates extraordinary people from the ordinary. The extraordinary commit to mastery and they gauge and measure every single thing in order to do better and get better results. On the other hand, ordinary people just do things accordingly. They never measure anything, not even their goals. They set goals, but they don’t measure their results. And most didn’t even review their goals. 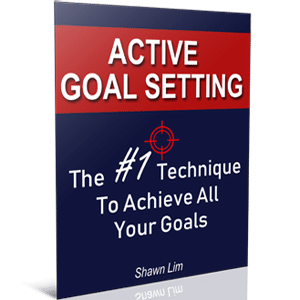 Ever wonder why people fail to achieve their goals now? My friend, if you want to be the best in what you do and create extraordinary results in your industry, make it your attitude to seek improvement and commit to mastery. There will be times when you feel like you’ve been treated unfairly because your colleagues, your friends, or even your family members are taking advantage of you when they ask you to do something that they don’t want to do. It doesn’t matter, my friend, to be successful, you must learn to do things that others don’t want to do or hate to do. In sales, people hate making cold calls. They are afraid of rejections. But if you choose to do it and do it wholeheartedly and properly, guess what, you can have more sales than those who aren’t willing to do the work in the first place. Ordinary people choose to do what is convenient, but extraordinary people choose to do what is difficult, hard or complicated. This is why they are extraordinary because they are willing to do the extra and go way beyond what normal people are willing to do. Successful people choose to do the impossible, they wake up early, they dream extremely big, they break the status quo, and they work at night in order to make their dreams come true. Those are hard stuff, but those are the sacrifices you need to make today to live a better tomorrow. When you are willing to do what others hate or not willing to do, and you become the master in it, that’s the time when you can command top dollars and create an advantage for yourself in the market. Think about it, it is easy to start a blog. Anyone can create a blog and try to make money from it, but few are willing to put in more effort to produce quality content, believe in their content and promote their blogs, and even lesser are willing to persist and do it on a consistent basis. This is why there are plenty of outdated blogs and crappy content out there. They are not willing to do the hard work. Most people are only willing to do what’s convenience. Thus, if you don’t want to be ordinary, choose to do the hard stuff and do what most people are not willing to do. Positive thinking is another commonly discussed topic when it comes to achieving greater success in life. It is true that positive thinking and being optimistic is important, most people underestimated its power. Do you know that when you are charged with positive emotions, you tend to be able to discover more opportunities and are able to see things clearly and also learn better? What will you do when you encounter a crocodile while taking a walk by the riverbank? Well, at this moment, the negative emotion of fear will kick in and everything else becomes not important to you. When you feel fear due sighting of the croc, your brain will put the danger as the number one priority. In that instant, you don’t really care if you have enough money to pay the bills or there are fish in the river. All other things become less important because your mind focuses on the fear that is in front of you. As a result, negative thinking actually narrows your thinking and focuses you on the problems. On the contrary, when you are feeling positive and optimistic, you’re able to see things more clearly and your mind focuses on all the possibilities. So make it part of your attitude and behavior to always be optimistic. When you are optimistic, you will think positive with positive emotions, and this opens your mind to better solutions and possibilities. This attitude is one of the most important keys that will determine if you’re going to be successful in life. Think about it, if you are not goals oriented, you will have no idea what to do and become reactive. You will do whatever that comes at you. Conversely, if you’re someone who is goals oriented, you always proceed and act according to your aim, you will become proactive and make things happen rather than waiting for things to come to you. What will happen if you have no plan for this coming weekend? Highly likely, you will sleep longer and wake up late. And after you get up, you may scroll your phone and check out updates on Facebook. After all, you have no plan and you don’t know what to do, so it is alright to do whatever you like, right? Maybe so, but this is the exact attitude and behavior that separates the successful from the unsuccessful. While I’m not saying that you need to be goals-oriented all the time and only think about your dreams and work on your goals 24/7, I’m saying that when you have a plan, a clear priority, or a goal to achieve, you will live a more organized, and proactive life. It is your definiteness of purpose that makes you clear about what you want to accomplish in life, hence, you are able to work toward the goals that you desire to achieve. Without a clear direction of what you want, you will end up like a lost sheep, following the crowd to wherever the crowd is going. The first step to breakthrough and become extraordinary is to have a clear purpose of what you want. In other words, be goals oriented. You need to know what you want and have a clear target in life so that you will never be distracted by others. Achieving great success can be an impossible task when you don’t believe that you can attain it. Believe that you can reach your goals and become successful is one of the fundamentals you required to get there. When you look at all the highly successful people who have accomplished an outstanding feat in their lives, the results they produced are impossible to many, but they went on to believe that it is possible anyway. Getting people to Mars is a mission impossible in itself, let alone building a colony and stay there. This is what Elon Musk wanted to do with SpaceX. His mission is to get humans to Mars and live there. He even jokingly said that he wanted to die on Mars, just not on impact. When the Wright Brothers tried to build a vehicle that can fly, most people thought that they were crazy. The same goes for all the inventions you see in this world today. The computer you are using was once something impossible, and the car you drive too. However, extraordinary people came around and chose to believe the impossible, and so they went on to make their dreams possible. This is why we have computers, cars, and everything else you see around you. The same goes for you. If you desire success, you must believe in the impossible – your vision. What you want to accomplish may seem far-fetched at your current situation, but if you are willing to work on it and believe that it is possible, it may become true to you. The ability to focus on your vision and divorce yourself from whatever is going on around you is one of the keys to Warren Buffett’s success. In my previous article, I wrote about how Warren Buffett able to achieve amazing returns in the stock market because of his ability to laser-focused on his portfolio. My friend, the grass isn’t always greener on the other side. Whenever you see someone is doing well and performing, it is hard to resist the temptation to want to go over, join them and profit together. Somehow, they’ve done it and all you need to do is to follow. This may not always be the right path. In the world of internet marketing, there is a word to describe this behavior, and people call it the “shiny object syndrome”. This is where you continue to buy products after products jump from one opportunity to another because of what the products have promised. You can buy a course on affiliate marketing today and you’re all excited because you have a new “hope”. You then tell yourself “this is it”, and you work on it. After a few weeks, you discover another product about e-commerce and you find that e-commerce is the trend now. Everyone is talking about e-commerce and you believe it is the next big thing. So you buy the course and jump in. You have totally forgotten about your affiliate marketing course. After a few weeks, you stop working on e-commerce because it seems you require a lot of advertising budget and marketing skill. And then it happens again, you stumble upon another “shiny object” that promises you it is the best course right now. So are you going to bite onto that offer? Stop jumping from one opportunity to the next. Instead, choose to focus on your vision and always remind yourself of your goals. Just take a look at Apple’s products. How many are there? Not much, yet, Apple is a billion-dollar company that is famously known for their products across the world. Develop the laser-focused attitude towards your dreams and your goals. And you will never need another so-called “proven” secret to success anymore. It is true that solely depend on hard work alone is not enough to get you what you want, but if you have done everything right, and you pour in hard work, magic will happen. Success will come to you and you will get the results you want. Of course, when you work on the wrong thing, no matter how hard you work, you will never produce the outcome you desire. When you have the right plan or follow the proven strategy, all that is left for you to do is to take action and put in the necessary work. I’m not suggesting you not to work hard, but rather, I’m suggesting you make sure your strategy is right and work hard on it. A lot of people seem to understand that success requires hard work, but many of them fail to realize that without a blueprint, they can never get what they want no matter how hard they work. If you don’t believe me, try to catch the sunrise by running to the west. You can never make it. Sadly, we have been conditioned by the society and the people around us to think that the only way to achieve success is to work hard. This is not true at all. Everyone has 24 hours a day, some people work 12 hours a day, but that doesn’t mean that they are successful. You have probably heard about people who work only a couple of hours a week, and because they have built a system that works on its own, they are earning huge amounts of money and have the freedom to enjoy life. To be successful, hard work is necessary, but so with a proven plan or a right strategy. Finally, you need to have a strong determination for what you want and choose to never give up. Most people lack the patience for their dreams. They feel motivated in the beginning, but after a few weeks down the road, their motivation fades and somehow, they never work on their goals anymore. Make patience one of your behaviors. And turn the spirit of never give up your attitude. Stop looking for “shortcuts” to get to where you want to go. If you want to build a million-dollar business from scratch, make sure you have a right plan, and more importantly, have the patience to work until things work out for you. The problem is that most people have big dreams and goals, but they don’t have the patience and determination to wait for things to come to them. They want to become a millionaire instantly. They look for quick ways to build a business so they don’t have to wait and work for a few years to see the reward. It is easy to understand when you equate success with losing weight or having a fit body. Is it possible to lose 10 pounds by just hitting the gym once? You may think that I’m crazy to say so, but when it comes to achieving success in life, this is the mentality that most people have. They want success immediately. They want to invest and earn money right away. They want to start an online business that makes them passive income from day one. You can make money within 24 hours if you know the right strategy, but the fact is that most people don’t. And they easily distracted by the next “big opportunity” and they jump from one business another way too fast. Previously, I have covered an interesting story you can learn to develop patience from a bamboo tree, you should read the article here. So have the patience, my friend. Have the determination to go on the journey and enjoy the process. Plus, never give up on your dreams. You can choose different ways to get to your destination, but never give up on getting there. Develop a strong desire for what you want. Have passion and be enthusiastic about what you do. Be willing to learn and commit to mastery. Do things that other people hate or are not willing to do. Always be optimistic and live with positive emotions. Be goals oriented and live each day with the clarity of purpose. Believe the impossible and have faith in your vision. Focus on your dreams and ignore the rest of the world. Work extremely hard and have a right strategy. Have patience and determination for what you want. And don’t give up. Honestly, there are more empowering attitudes and behaviors to succeed in life, but it’s not about the number and how many attitudes or behaviors you need. It is about how much you can take, absorb, and apply in your daily life that matters. I have provided ten of the attitudes and behaviors above, so what are you going to do right now? Today l decided to become a successful artist ..